Canada has wide-open spaces, well protected by their remoteness from possible hostile intrusions. Its population, among the largest in the British Commonwealth, can provide many recruits. Canada’s industrial infrastructure can produce airframes for training planes, with U.S. manufacturers, not too far away, supplying the engines, or even complete aircraft if the need arise. Towards the end of the 1930s, Canada met all the requirements to become the training ground for the air force that the defence of the British Empire demanded. The Canadian government was not too receptive, however, to the first British proposals for setting up air training schools on its territory. Prime Minister King did not want Canada to get involved in the war by supplying pilots. In addition, he was concerned that the interference of imperial armed forces would not allow Canada to develop its own national air force. Lord Riverdale (on the left) and W.L. 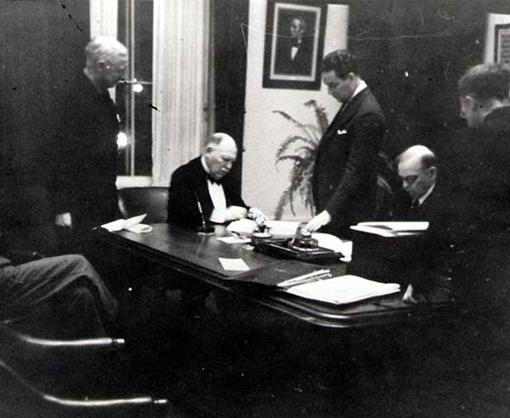 Mackenzie King (on the right) signing the BCATP Agreement on December 17th, 1939. But the proclamation of the state of war on September 10th, 1939, changed the situation entirely. The Canadian Parliament, having voted to support Britain’s war effort, had now to decide what form that support would take. Large-scale airmen training on Canadian soil seemed to be a significant contribution, and also one that would keep to a minimum the number of soldiers serving overseas. The government agreed, therefore, with a new proposal to that effect submitted by British PM Neville Chamberlain on September 26th, 1939. Developed by Vincent Massey and Stanley Bruce, respectively Canadian and Australian High Commissioners in London, the project called for the establishment of 90 schools, that would train some 50,000 men for the air force, among which 20,000 pilots. A British delegation headed by Lord Riverdale visited Ottawa in October to finalize the agreement. To Lord Riverdale’s surprise, his statement to the House of Commons on the cost of the programme was received with dismay: he asked that Canada pay some CAN$370 million out of a total budget of CAN$888.5 million. For the MPs this was an astronomical amount: in 1939, the whole federal budget was CAN$500 million! In the following weeks, negotiations were conducted at a frantic pace and in a climate of extreme tension. The patronizing and centralizing attitude of the British party was a source of irritation for the Canadian negotiators who were intent on preserving their country’s sovereignty. “Amazing how these people from the Old Country seem to think that all they have to do is tell us what is to be done” wrote King in his diary. Among contentious issues, besides the sharing of the costs between Great Britain and the Dominions – Canada, Australia and New Zealand –, was the difficult matter of Article 15: what proportion of trained pilots were to join national air forces, such as the Royal Canadian Air Force (RCAF), the Royal Australian Air Force and the Royal New Zealand Air Force? The agreement was signed in the early hours of December 17th, 1939. The official announcement was made later that day, on the 65th birthday of the Canadian PM. King, an outstanding negotiator with years of experience in labour disputes, had decided he would celebrate the agreement on that date. The British Commonwealth Air Training Plan was an ambitious programme. The 1939 agreement stated that the training was to be similar to that of the RAF: three Initial Training Schools, thirteen Elementary Flying Training Schools, sixteen Service Flying Training Schools, ten Air Observer Schools, ten Bombing and Gunnery Schools, two Air Navigation Schools and four Wireless Schools were to be created. For each four-week period, 544 pilots, 340 navigators, 580 wireless operators / gunners were to be trained. Canada was to supply 80.64% of recruits, Australia 11.28% and New Zealand 8.08%. For her part, Great Britain was to supply up to 10% of Elementary Flying Training Schools and Navigation Schools recruits, that number including trainees from Newfoundland. To reach those ambitious goals, Canada had to recruit 1,536 men per four-week period, i.e., 19,968 men every year. It would be allowed to retain every month 136 pilots, 34 navigators and 58 wireless operators / gunners from the graduates, to man the Home War Establishment (HWE) squadrons. The first Canadian graduates were to stay in Canada and serve as BCATP trainers rather than be assigned to overseas theatres. To provide adequate flight training, 3,540 aircraft were needed: 702 Tiger Moths and Fleet Finches, 720 North American Harvards, 1,368 Avro Ansons and 750 Fairey Battles. Great Britain made a commitment to supply a significant proportion of those planes. The agreement signed in December 1939 was to expire in March 1943. The total cost for implementing the plan was estimated at CAN$607,271,210. Great Britain agreed to provide CAN$165 million worth of equipment. Canada was to pay for the initial training schools, i.e., CAN$66,146,048. The balance, CAN$356,125,162, was to be divided between the dominions according to the number of trainees provided. For Canada that amounted to CAN$287,179,331. Was Canada up to a challenge of such magnitude, with the help of Great Britain and allied dominions? Indeed, not only those objectives were met, they were exceeded! On October 3rd, 1939, the RCAF and the Department of Transport reached a key agreement for the accelerated development of the infrastructure required by the BCATP. The Department of Transport was responsible for selecting the sites and – after approval by the RCAF – preparing the airfields. The RCAF was responsible for designing and building the facilities. Site identification and surveying had started even before the BCATP was signed. 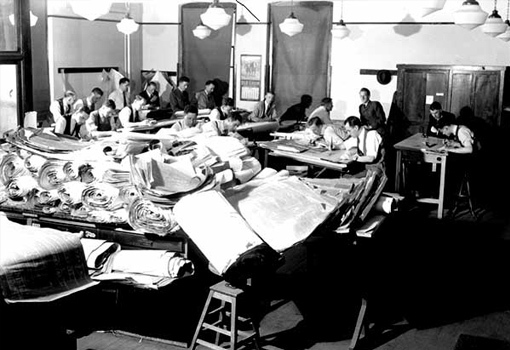 Architects and draftsmen working feverishly on the plans for new BCATP facilities at the RCAF HQ in Ottawa. National Defence Image Library, PL 522. The BCATP required buildings and airfields for 64 schools. The sites had to provide a secure approach, be large enough, well drained and with easy access to utilities, as well as with a good supply of drinkable water. BCATP airfields usually included a main airstrip and two secondary ones. Among the sites selected, 24 were already developed, needing only some additional buildings. Eighteen of those were to be the Plan’s first schools. On the other sites, extensive construction work was required: a colossal undertaking as 1.75 million blueprints were made, 33,000 drawings selected and 8,300 buildings erected. In February 1940, the BCATP was placed under Air Commodore Robert Leckie. Later, in November, the Training Division, which was in charge of implementing the BCATP, was raised to Air Force HQ level. Four regional commands were created to implement the plan: No 1 Training Command, with its HQ in Toronto, for Central Ontario; No 2 Training Command, based in Winnipeg, covering an area extending from Northern Ontario to Northern Saskatchewan, No 3 Training Command covering Eastern Ontario, Quebec and the Maritimes with its HQ in Montreal; No 4 Training Command was responsible for Southern Saskatchewan, Alberta and British Columbia with its HQ in Calgary. Each command had its own recruiting offices and supply services. 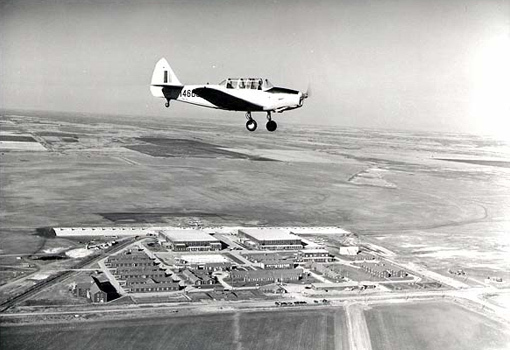 A Fairchild Cornell flying over Elementary Flying Training School No 19, Virden, Manitoba, October 1944. Photo by Nicholas Morant. Department of National Defence / National Archives of Canada, PA-169141. The BCATP was launched on April 29th, 1940, two weeks before Germany’s blitzkrieg against the Netherlands, Belgium and France. The first cohort of pilots, 39 men, received their wings at Camp Borden, Ontario, on September 30th, 1940. The first air observers graduated on October 24th. On September 1st, 1941, the sixteen Service Flying Training Schools called for by the BCATP were in operation: seven months before the scheduled date. At the end of 1941, all the schools had been built – except for one bomber/gunner school that was not yet required. A total of 36,609 recruits have enlisted in the BCATP, way above the forecast figure of 25,120. In the summer of 1940, Great Britain remained alone to fight off a possible German invasion and had to stop the delivery of Avro Anson trainer planes. Canada was forced to find immediately an alternate source of supply if the BCATP is to be upheld. In Ottawa, Minister of Munitions and Supply C.D. Howe had a solution ready: Canada was to build its own version of the Avro Anson, modified to be fitted with a U.S.-made Jacobs engine: quite a challenge for a country whose aeronautical industry was still in its infancy. During the six years that WWII lasted, Canada produced a grand total of 8,076 Anson, Harvard, Tiger Moth, Finch and Cornell trainer planes. On June 5th, 1942, a new agreement was signed between Great Britain, Canada and their allies to extend the BCATP until March 31st, 1945. This renewed programme gave Canada increased control over the training and included revised trainee quotas for participating countries. It also allowed for some changes to the training as such, changes made necessary by the evolution of aerial combat in Great Britain and in Europe. The Allies’ intensive air warfare against Germany starting in 1940 came with a heavy cost in lives and material. The BCATP’s uninterrupted success ensured that competent pilots, navigators, bombers, wireless operators, gunners and engineers were in sufficient numbers to take part in the many fight, bombing and anti-submarine missions. In 1944, the RAF and the Allied air forces finally got the advantage over the Luftwaffe and dominated European skies. With fewer air force men killed or wounded during missions, air force personnel needs decreased and so did the number of BCATP trainees. At the end of 1944, the Plan was working on putting an end to its operations. The BCATP ended on March 31st, 1945. It had received 159,340 trainees, among which 131,553 (including 49,507 pilots) successfully completed the course of study. They belonged to the RAF (42,110), the RCAF (72,835), the Royal Australian Air Force (9,606) and the Royal New Zealand Air Force (7,002). The 72,835 RCAF airmen comprised 25,747 pilots, 12,855 navigators, 6,657 bombers, 12,744 wireless operators / gunners, 12,917 gunners, and 1,913flight engineers. Newfoundland, Free France, Poland and other nations at war with Germany also benefited from BCATP training. Through the BCATP, tens of thousands of young men from different countries – Canadians, Australians, New Zealanders, British – settled throughout Canada for shorter or longer stays, depending on the requirements of their training programmes. Some trainees boarded with families. Both military and civilian trainees took part in local activities, frequenting restaurants, dancing halls, churches and other attractions in communities near their bases. Friendships and romance followed: it is estimated that some 3,750 Canadian women married foreign BCATP airmen. The BCATP’s total cost reached CAN$ 2,231 million, Canada’s share amounting to CAN$ 1,589 million. Expenses incurred for building facilities and airfields, manufacturing aircraft, tools and vehicles, supplying food and power, maintenance contracts meant new jobs for the civilian population and were a significant factor of economic revitalization in communities near training schools and throughout Canada. From a military, social or economic perspective, the BCATP produced impressive results. On November 6th, 1941, U.S. President Franklin D. Roosevelt called Canada “the aerodrome of Democracy”. He was right. F. J. Hatch, Aerodrome of Democracy: Canada and the British Commonwealth Air Training Plan, 1939-1945, 1983.